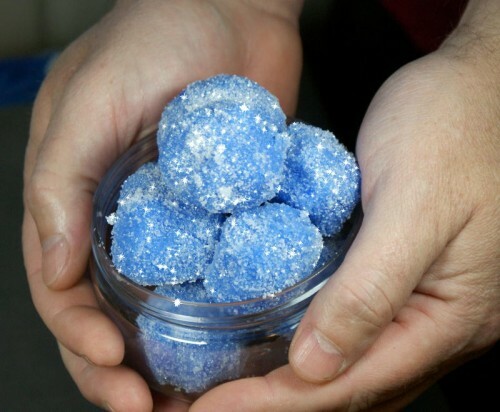 These sparkling DIY solid sugar scrub snowballs are not only a fun way to pamper yourself this winter, but they also make unique DIY Christmas gift ideas for any bath and body lover! 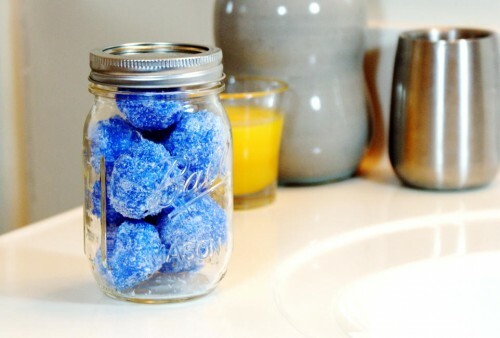 These DIY solid sugar scrub snowballs are are pretty straight forward and easy to make. Just give yourself a few hours and you’ve got the perfect pampering Christmas gift! To make these DIY solid sugar scrub snowballs, begin by using a digital scale to weigh out the shea butter, cocoa butter and emulsifying wax. Combine in a double boiler or a large glass Pyrex measuring cup then heat in the double boiler or in the microwave at 50% power until all the ingredients have melted. Remove from heat. Weigh out the grapeseed oil – or another carrier oil like hemp seed oil, rosehip seed oil, pumpkin seed oil, or jojoba oil – the coconut oil and, if desired, the fragrance oil you’ve chosen to use. (You can also use half the amount in an essential oil or essential oil blend of your choice.) Stir into the melted butter and wax mixture until they are completely melted. In a separate container, weigh out 11.4 oz. of sugar. 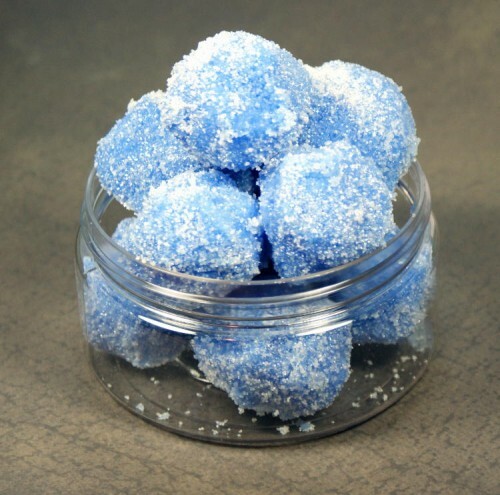 Depending on how blue you want your snowballs, add a pinch to 1/4 teaspoon of the blue ultramarine pigment powder. (You can use other colors as well or omit the color all together.) Whisk the pigment powder into the sugar until it is evenly distributed throughout and there are no clumps. Allow the melted butters, wax and oils to cool slightly. You want to be able to handle the oil without being burned. While this cools, prepare your snow sparkle ingredients. Weigh out 2 oz. of sugar into a container. Now measure out the mica and whisk into the sugar until it’s evenly incorporated. Now slowly pour the sugar into the melted butters, wax and oils whisking with a fork as you go. You’re now ready to form your snowballs! I used my hands for this part, however you could also use a bath bomb mold or a meat baller for uniform sugar scrub snowballs. Lay a piece of wax or parchment paper onto a flat working surface and pour about half of the snow sparkle ingredients on the paper. Now form the sugar scrub mixture into balls the desired size. These will feel like they aren’t very solid and a little like they won’t stay together, but they will. Pack the balls as tightly as you can then roll them into the snow sparkle ingredients one at a time, adding more of the sugar and mica mixture as needed. Sprinkle additional sugar and mica onto the balls as desired. Arrange the snowballs you’ve just made gently onto a plate, the place the plate in the refrigerator for about an hour or until the snowballs have hardened completely. Now remove the solid sugar scrub snowballs from the refrigerator and package as desired in a large mason jar or in plastic containers. Your completed DIY solid sugar scrub snowballs not only crush easily in the tub or shower for use, but also offer nourishing moisture and exfoliation for dry skin without feeling oily. And they sparkle just like real snow! 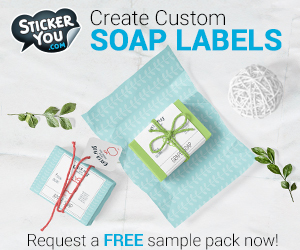 Now simply label or decorate your packaging as desired for gifting! For more of my homemade bath and body recipes as well as favorites from around the web, be sure to check out and follow my DIY Bath and Body board on Pinterest. If you’re looking more homemade Christmas gift ideas, you’ll also enjoy my Christmas gift idea boards on Pinterest – Unique DIY Christmas Gift Ideas and DIY Stocking Stuffer Sized Christmas Gifts. You can also find and follow me via Blog Lovin’ and Tumblr, Facebook, Twitter, G+ and Instagram. It seems so pretty and makes me want to wash my face right now!!! I am jut wondering any surgar can be used? Also,any other powder or seeds can be used instead of sugar?i saw cofee bean powder scrub in Korea. So… curious.